Puriﬁcación Leon Murrah (known as Puring, Purity, Ditche, or NANA) was born on December 7, 1947 in Manilla, Philippines. She was born to Marcos Deleon and Nemencia Deguzman Deleon. Puriﬁcación was an amazing woman who was kind, warm, selﬂess, caring, giving, and most of all PURE, just like her name. Puriﬁcación was a daughter, sister, mother, and grandmother, and wife. 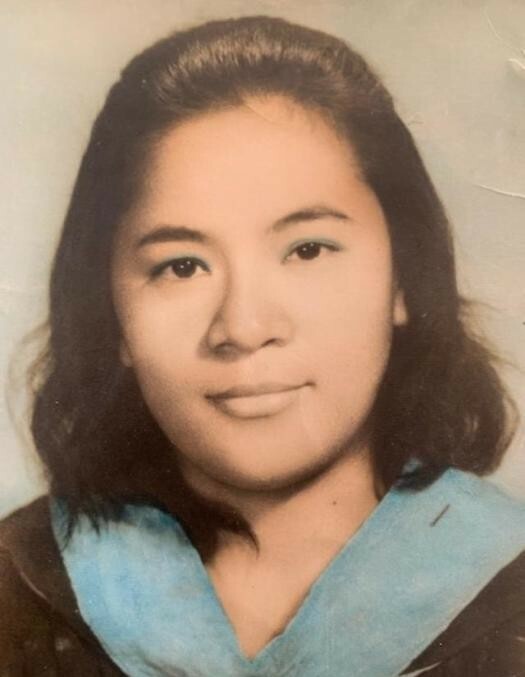 She lived in the Philippines for just under half her life until she went on to pursue her nursing ambition and career in London, England. Shortly after moving to London, England she met her Husband Theodore Murrah. A true love from the moment she met him. They both had a son and named him Karl Deleon Murrah. Before their son was born they moved to San Diego, California where she resided for the rest of her life. Puriﬁcación was always known for being so caring to other people and putting herself last and others ﬁrst. She worked hard and loved even harder. She was an amazing cook who could make any person say WOW!!! Anyone who ever met her always left with a smile on their faces and joy in their hearts because of how she treated everyone the same. She saw people for people no matter who they were. Puriﬁcación will always be remembered for her very quiet personality but infectious smile. She never let anything get in the way of being a positive person in her community. She was a Christian who believed in God, and loved her Church (A Blaze for Christ). She loved to sing and worship every Sunday. Puriﬁcación also loved watching the TV show Wow Wow Wee, it made her laugh and smile nonstop. She always gave to her favorite charity in the Philippines “Bantay Bata”. Her biggest accomplishment is becoming a mother to Karl Deleon Murrah and grandmother to her Son’s kids. Puriﬁcación was the NANA to her grandchildren and she showed it! On April 1st 2019, she earned her wings to glory. Puriﬁcación leaves to celebrate her life and cherish her memories, Karl Deleon Murrah, Marisol Murrah, Ayana Lynn Seiben-Murrah, Roman Theodore Murrah, Airyel Montana, Fernando Solano, Nemencia Deleon, Lourdes Deleon, Ricardo Deleon, Rebecca Deleon Nave, Boyet Deleon, Eric Deleon, Gina Deleon Nieras, Evelyn Deleon Perez, Lando DeLeon, Mark Deleon and a host of friends and family all over the world. She will truly be missed!